Sixteen people detained by Italian police in betting probe. FORMER ITALIAN INTERNATIONAL footballer Giuseppe Signori is currently being held under house arrest after a police sting closed in on 16 people suspected of match-fixing, according to reports by Italian news agency ANSA. 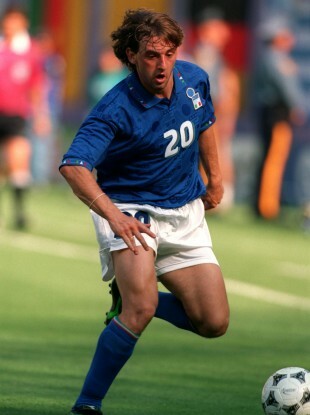 Signori, 42, who scored 19 times in 45 appearances for the Italian national side, was one of nine people detained at home by Italian police earlier this morning. Former Serie A players, current players from both Serie B and Serie C, and a number of club directors from the country’s lower leagues are believed to be among those who have also been placed under house arrest by order of magistrates in Cremona. Seven arrest warrants were also issued, with ANSA reporting that those targeted were members of a criminal organisation which sought to manipulating the outcome of football matches. “Don’t you have any pity in this situation? Have some mercy. I can’t say anything. I will meet with my lawyer and then he’ll speak for me,” Signori told ANSA before being taken to Bologna for questioning. According to reports in USA Today, prosecutor Roberto di Martino informed a news conference that the investigation was launched following a Serie C match between Cremonese and Paganese in November 2010, during which some Cremonese players allegedly had their drinks spiked with sleep medication so that they wouldn’t play well. “One player was involved in an unexplainable car accident, after which Cremonese registered an official complaint with the police,” Di Martino said. Email “Italian ace Signori under house arrest following match-fixing sting”. Feedback on “Italian ace Signori under house arrest following match-fixing sting”.